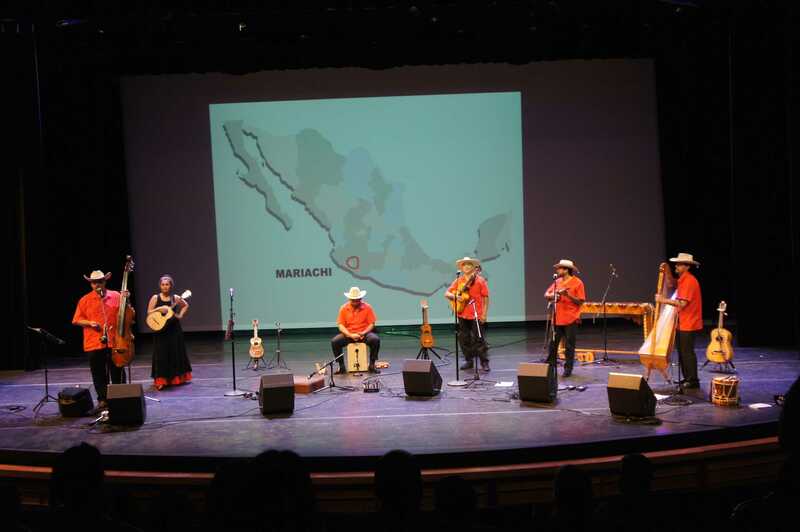 As part of NEIU’s celebration of Hispanic Heritage month, the Grammy Award-nominated Sones de Mexico took listeners on a musical tour of Mexico, showcasing its wide variety of styles. I’ve only been to Mexico once. When I was 10-years-old, I was visiting my aunt in Texas. One day during my visit, we drove across the border to spend the day in Mexico. 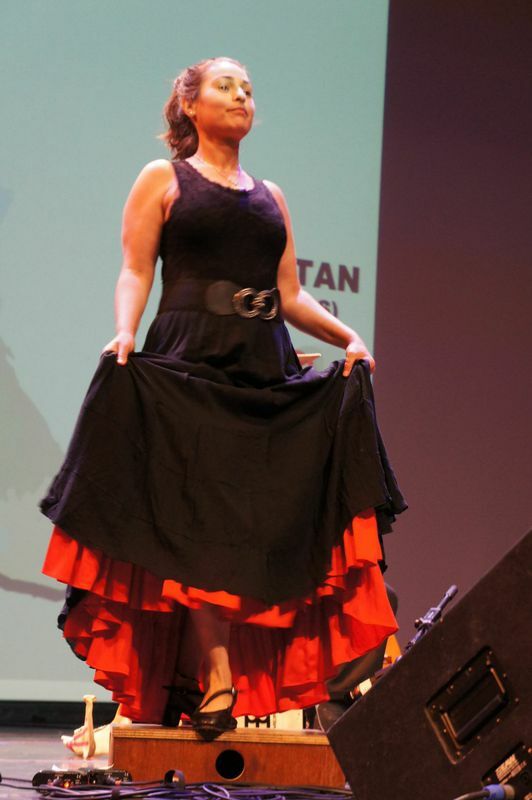 NEIU alumna Lorena Iñiguez grew up performing Mexican folkloric dance with her father, a Jalisco native. I still remember the colorful street shops that lined the sidewalks—lucha libre masks dangling overhead and bootleg Batman dolls labeled “Bat-Hero.” I remember the smell of crispy gorditas cooking the hot summer air. But most of all, I remember the street musicians. We stopped for lunch, and as I sank my teeth into a stuffed poblano, there on the corner just outside the restaurant were three men playing music. (Left to right) Juan Rivera and Zacbé Pichardo playing traditional Norte music which blends traditional Mexican music with European polka and classical influences. Bass player and founding member Juan Dias explained to the audience that the reason mariachi is often seen as the quintessential Mexican style is because Mexico had a boom in the film industry during the ‘50s. Around the world, images of sombrero wearing mariachi singers with big guitars and thick moustaches were sent out all across the world, and Mariachi became the unofficial sound of Mexico. “Sometimes mariachi gets stereotyped as the only form of Mexican folk music, but that’s not the case,” Iñiguez said. Thanks to Sones de Mexico’s edifying performance in the Auditorium last Monday, I now know that the music I remember so vividly was not mariachi, but was in fact Norte music, a Mexican style infused with European polka and classical music. The Norte music I saw, however, was just three guys. 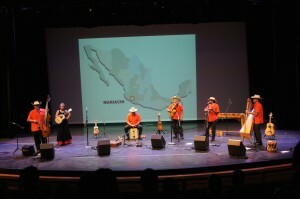 Sones de Mexico had full orchestration with upright bass, guitar, percussion, a plucking violin melody and even a harp. Many western Mexican towns claim to have originated Mariachi music. Sones de Mexico had an impressive collection of instruments, utilized differently throughout the regional styles like the harp in the Norte music. The “Son de Marimba” originating from the Chiapas, Tabasco and Oaxaca regions featured exciting melodies on the vibes; the Yucatán regional music employed a special tapping floor that Iñiguez danced masterfully on; and the “Son de la Iguana” from the Costa Chica region included the jaw of a donkey used for percussion. As they moved across regions, Dias explained how different cultures and international music influenced the different regions of across Mexico, like the European influence in Norte music, for example. 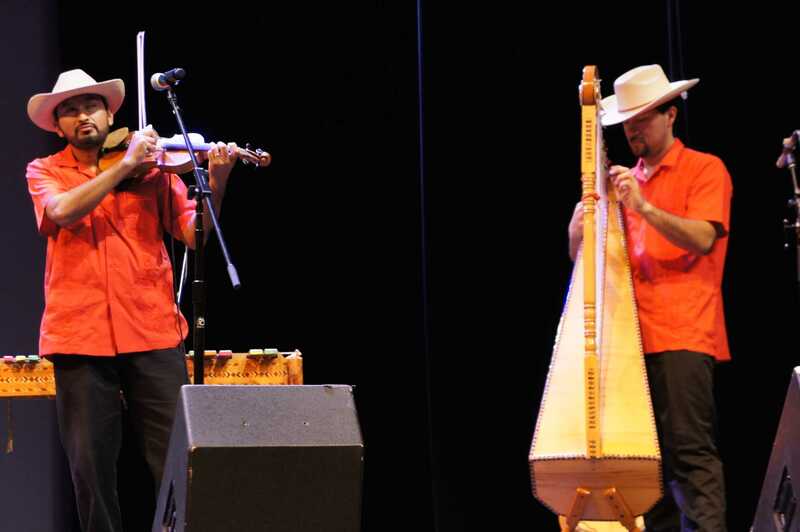 The Yucatán regional music has strong Mayan and Caribbean influence. And the Planeca music originating from Nopaltepec had a heart-hitting call and response influenced by African music. The highlight of the performance was a haunting tune called “Son Istmeno” from Tehuantapec, which translates to “The Legend of a Weeping Woman.” I’d heard and liked the song before, and thanks to Sones de Mexico, I now know what to google to hear it again. Along with Iñiguez and Dias, current members include Gonzalo Cordova, Jorge Leal, Juan Rivera and Zacbé Pichardo. In 2007, Sones de Mexico’s unconventional take on “This Land is Your Land” was nominated for a Grammy for Best Mexican/Mexican American album. NEIU will conclude its celebration of Hispanic Heritage Month with a special celebration of Latino culture with “Noche de Familia” held on Wednesday, Oct. 15 from 6-8:30 P.M. in the Alumni Hall. Growing up in Chicago and attending Northeastern, I’ve made a lot of Latino friends. I’ve had homemade stuffed Poblanos that were every bit as good as the ones I had in Mexico when I was a kid. I’m a regular at the Galli Lucha Libre in Villa Park. El Patrón 95.5 FM is number three on my radio dial. I may not be Latino, but I’m proud to join the celebration of Hispanic Heritage Month.